Millennium Foundation Kosovo has moved to new premises, where the team will be working next 4 years in implementing MCC-supported Threshold Program. 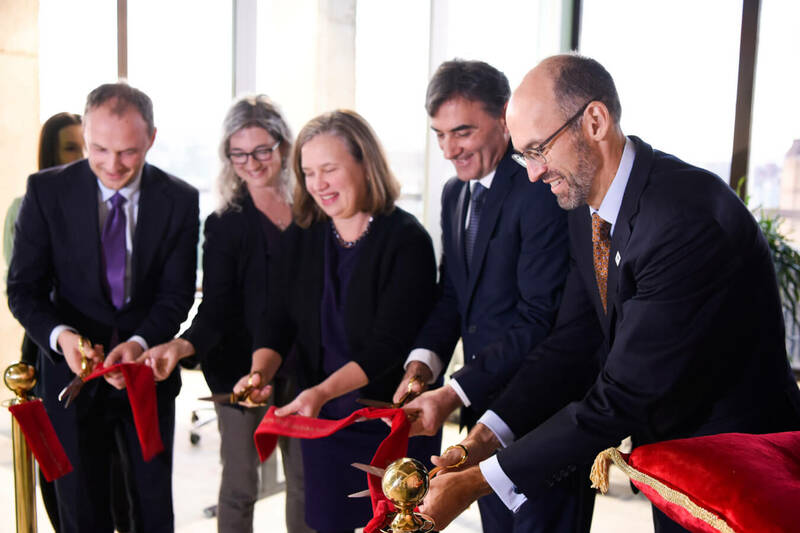 The formal cutting of ribbon for the new office was done by US Embassy’s Chargé d’Affaires Colleen Hyland, Managing Director of Millennium Challenge Corporation James Gerard, MFK’s CEO Petrit Selimi, as well as MCC’s Kosovo Country Director Sarah Olmstead. The office space is located on the ninth floor, Migjeni Street 21, in central Prishtina (old Ljubljana Bank building) and is an in-kind donation by the Government of Kosovo to the Threshold Program. The renovation was co-financed by MCC and GoK. The design and implementation of works were done by Ljubljana-based architects SADAR + VUGA with Tina Hocevar, as well as local architects Bekim Ramku and Mentor Haziri supervised by MFK’s Petrit Selimi and Rina Meta.